Check it out! My first novel, Unraveled, is now available in audio, too. Have you tried listening to a novel yet? Podcasts and audiobooks are a recent addition to my grown-up life. As a little kid, I savored every minute of sitting and listening to a story out loud. Now I feel as though I’ve had to re-train my brain to listen well. Life moves pretty fast these days and existing in a constant state of multi-tasking seems to have changed the way I process information. As a writer and voracious reader, I’m finding that screen fatigue is starting to be a thing, so listening is a welcome relief for my tired eyes. My friends who are frequent consumers of audiobooks tell me they listen in the car, while folding laundry, or exercising. Since modern technology offers the convenience of syncing devices, users seem to appreciate the almost-effortless transition between listening in the car to picking up where the story left off with just a few swipes on their phones. This article in the Wall Street Journal claims audiobooks are the fastest growing format in the business, due to humanity’s ability to carry our entertainment with us at all times. While I ignorantly assumed audiobook production was easy-peasy, I quickly learned that was not the case. First I put out a call for auditions on ACX.com, which is where you go if you aren’t equipped to narrate your own novels. Laura Jennings dazzled me with her previous experience as a narrator, as well as with her efforts on the audition. I love hearing the way she brought Blake and Lauren to life. Initially, it’s a little unnerving to hear your words read back to you, but then I got caught up in the story and really enjoyed listening. So much so, that I kind of forgot that I wrote it. Ha! Once I approved the completed audio files, it waited for final approval from the powers that be, then went on the market at Audible.com. Woot! Woot! As you probably noticed, audiobook covers are slightly different than the Kindle or paperback editions. I’m super proud of this cover already, and glad it didn’t require much to make it audio-friendly. A huge shout out to Lynnette Bonner for working her magic once again. Blind-sided by her fiancé’s questionable behavior, Lauren Carter returns to the one place she’s managed to avoid, the small Alaskan town she used to call home. She’s spent years running from her scandalous past and now she’s forced to confront an uncertain future. Blake Tully, wildly successful owner of Emerald Cove’s new whitewater rafting and kayaking business, finds Lauren’s unexpected reappearance in his life ignites old feelings. Although she broke his heart once, he longs to give his childhood sweetheart a second chance. Will Lauren allow her shameful secret to define her? Can Blake forgive her when he discovers the reason she’s been hiding? 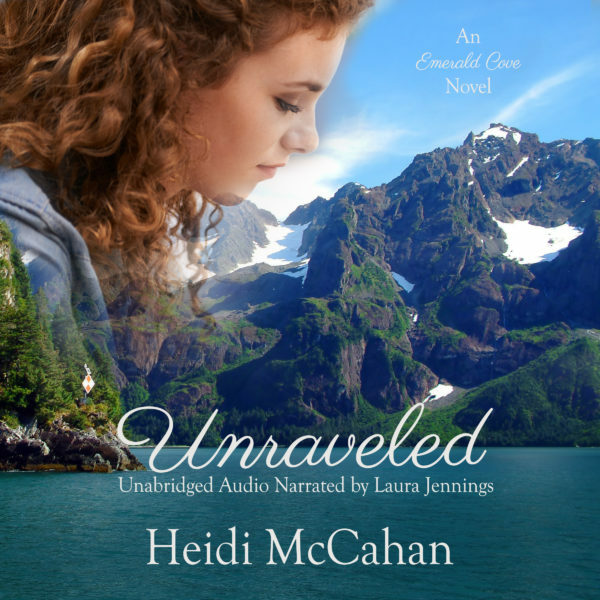 Giveaway time: Five audiobook copies of Unraveled are up for grabs. All you need is an Amazon account, which you’ll need to log in and redeem the gift. Please share the name of your favorite podcast or audiobook in the comments below before February 28 2017 at midnight EST. I’ll choose 5 random winners and announce them in the Sunday edition on March 5th. How exciting for you:) We listen to audiobooks all the time in car with the boys- it is a great way to settle my oldest son as we drive to school in the morning. My husband listens to podcasts and audiobooks while he runs, when he wakes up early, when he works in the garden…a lot!! One of our family favourite narrators is Gareth Cassidy, who narrates some of Ian Whybrow’s kids books. He really gets into the story, different voices. The boys are getting into Frank E Peretti’s Cooper Kids series- I have to admit it took us awhile to adjust to his accent; for some reason, a British accent is easier to understand to my ears, than a strong American one- odd I’m sure!! Thank you. Yes, the more I listen, the more I seem to develop preferences for a particular narrative style. It doesn’t bother me if a romance has one narrator for both the hero and heroine point of view, but some listeners feel one should be male and one should be female. I’ll have to check out the Cooper Kids series–I am not familiar with that. We used to do a lot of Adventures in Odyssey on road trips, but my boys are ready for something else now. Thanks for taking the time to comment. This is so exciting, Heidi! I often listen to Joyce Meyer during my commute into work, but I should listen to books too, since my reading time is so limited. Congratulations! I love that cover! Congrats Heidi! What an inspiring serene cover with the mountains and lake. Reminds me of the Interlaken area in Switzerland. While I personally prefer to read a book, I did use audio renditions of major American literature in my high school classroom. I was always amazed at some new insight I heard in the audio version, that I had missed in reading the piece. Are you from the Interlaken area? My grandfather was born and raised in Wilderswil, near Interlaken. I was lucky enough to visit there a few years ago and see the house he grew up in. It’s a gorgeous area, and I’d love to go back and explore some more. Congrats on getting your book in a new format. I’ve tried a few audiobooks, but it’s still not my default format for buying books. Valerie Comer posted about them last year and had me considering listening to books more and more—mostly because I’ve been screen fatigued myself. I kind of forgot about the possibility for a while (also not all books have an audible version), but I’ll have to consider this option more frequently. Thanks for the reminder. Hi, Priscila. Audio is definitely a big switch from reading. I still prefer reading, as well. But sometimes listening can be refreshing. Yes, I think Valerie has a number of her books available in this format, too. Take care! Yes, I have seven titles in audio now (plus a 3-in-1 bundle) and more coming in 2017. Heidi’s narrator sounds great as well! Hi Heidi, I’ve never listened to an audio book, but I do put my kindle on text to speech and have my kindle read my books to me. I know it’s not the same because it’s only a computer type reading but it helps when I need to multi task. I have listened to many sermons and seminars on pod cast. I don’t really have one that jumps out at me. There are some pretty fantastic speakers out and around. Hi Marylin! Yes, that’s a great way to edit a manuscript, too … the text-to-speech feature. You hear mistakes you just gloss over when you read. There are a lot of great podcasts … too many to choose from sometimes. Thanks for stopping by. Congratulations!! I do love audio books. Especially when I am in the car. I was on a long road trip and I listened to Terri Blackstock’s If I Run. I actually hated to stop and get gas. lol!! Now that’s a sign of a great audiobook, when you don’t even want to stop for gas. Ha! If I Run is on my to-be-read/to-be-listened-to list. I’m glad you love this format, Dana. You are a new author to me. I love listening to audio books. My favorite is Pepper Basham’s The Thorn Bearer. I have already listened to it 3 times, and I will listen again sometime. The narrator is WONDERFUL!!! I love to listen while I am busy around the home. It makes the work go by faster. Hi there. Thanks for taking the time to comment. Have you read A Twist of Faith by Pepper Basham? Sooo good! One of my favorite reads of 2016. She has more novels releasing this year, too. Can’t wait. Happy listening! Yes, I have read all of Pepper’s books and have pre-ordered her newest one. I love podcasts, but usually only listen to books that are geared towards my children. I’d love to listen to a grown up book for myself! Some of my favorite podcasts are The a Happy Hour with Jamie Ivey, the God-Centered Mom, and The Megan and Rachel Show. Hey, Melynda. I LOVE The Happy Hour with Jamie Ivey. I learn about so many interesting people, laugh a little, and sometimes cry, too. She’s got a good thing going there. Blessings! I remember writing about this and how it made me cry. The book and the movie was good but too sad. He has a knack for taking us on an emotional journey, that’s for sure. Blessings! Oh how I wish I was eligible to win this. :) Fantastic cover. Congrats on the audiobook. Thank you very much, Kimberly! Congrats,sounds like a great read. I haven’t listened to an audio book yet. My son listens to them when he travels and enjoys them. Hi Diana. Thanks for taking the time to comment. If you’re ever interested in listening to audiobooks, I’m pretty sure Audible.com lets you listen to one for free with a 30-day trial. Blessings! It’s been a long time since I’ve listened to an audiobook, but when my brother and I were young we would listen to audibooks a lot during family car trips. I always like listening to the Ramona Quimby books and The Great Gilly Hopkins. Hi Jessica! We love Adventures in Odyssey with our boys on road trips. Sadly, they’ve kind of lost interest and would rather watch a movie now. It’s a great way to pass the time on the road. Thanks for commenting. Wow, this sounds like a fantastic audio book! I really enjoy listening to the podcast Love Rice. If you haven’t heard of it, please check it out. It is full of great tips, stories, and much more for women. I also really love listening to Cozy Mysteries on audio, Krista Davis has this fabulous narrator who does her series. Two different gals but they make the book! Happy listening! Hi Bree! I will have to give Love Rice a try. Thanks for the recommendation. I have never listened to a Cozy Mystery before. I’ll check out Krista Davis, too. Thank you for stopping by. Thank you, Carrie. :-) Lynnette Bonner does excellent work. I love the cover on this one! I don’t listen to audiobooks as I’m hard of hearing and afraid to try it due to that. I don’t hear the higher pitches well, or the real quiet voices. Even if I watch a DVD movie (which I don’t take time for much anymore), I have the captions on. Hi Andrea. I can imagine audiobooks would be a frustrating format for you. Thank you for taking the time to read my post and comment anyway. Blessings! I agree with Andrea your cover is beautiful. I lived in Alaska for nearly 6 years. Once you’ve been there it’s always in your heart!